It’s Friday!!! Time to wind down from the long week and what better way than to enjoy another fall favorite flavor. Besides Caramel, another favorite flavor of fall for myself is Pumpkin. I always looked forward to Pumpkin Pie on Thanksgiving as a kid and to this day I still crave it this time of year. But now that I am an adult, I like to experiment with the flavors I have always loved and deconstruct old favorites into new products. 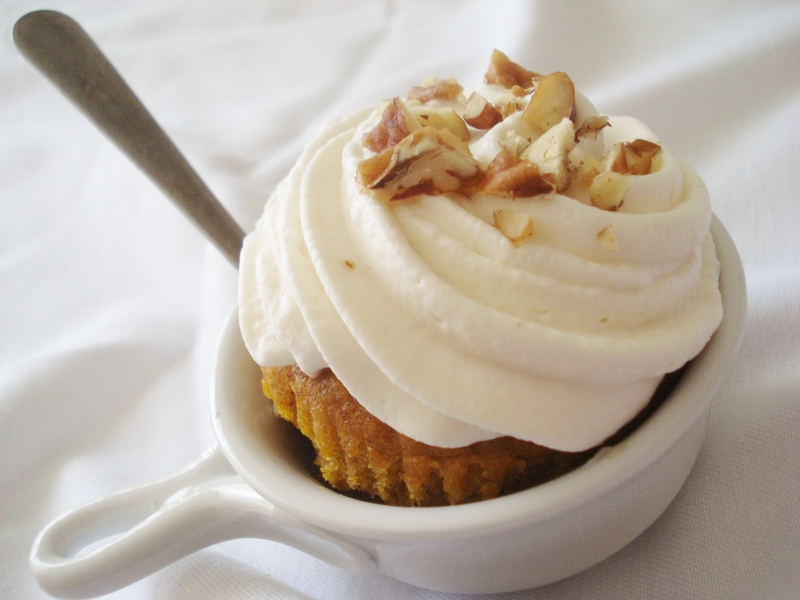 Today’s post is the result of a deconstructed Pumpkin Praline Pie translated into a cupcake. 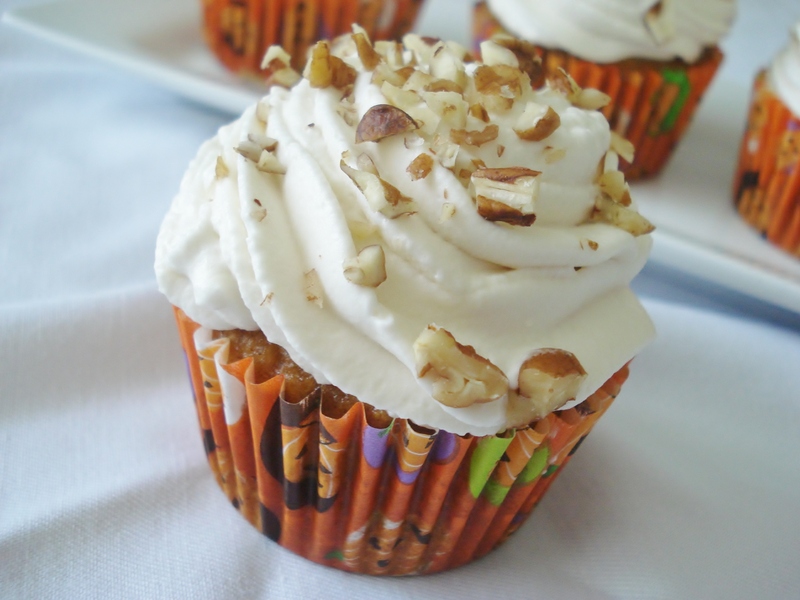 The beauty of these cupcakes are they have the wonderful flavors of a Pumpkin Praline pie but are far easier to transport than the traditional pie and are easy for kids to swipe and run away with before you even knew they were in the kitchen. 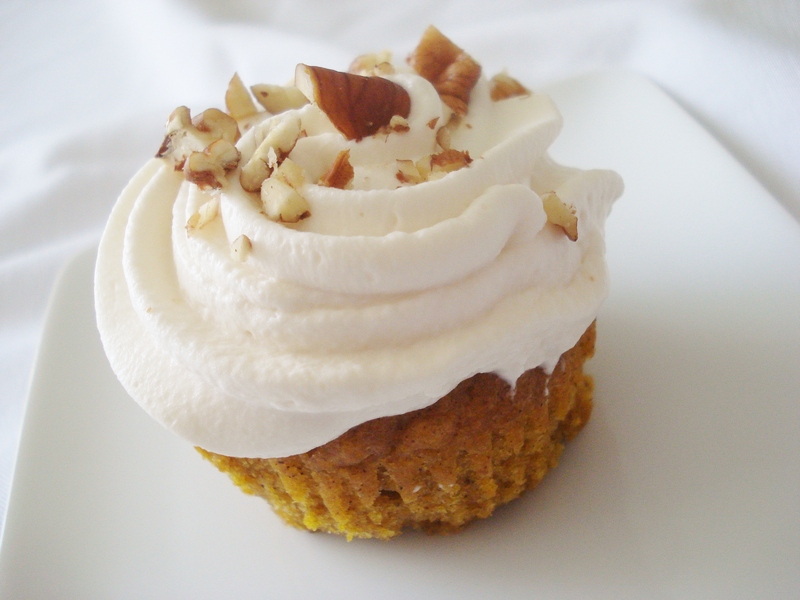 The base of the cupcake is rich in pumpkin flavor and accented by a great blend of spices. For the Pumpkin Pie Spice I chose a blend that contained China Cinnamon, Allspice, Nutmeg, Ginger, Mace, and Cloves. 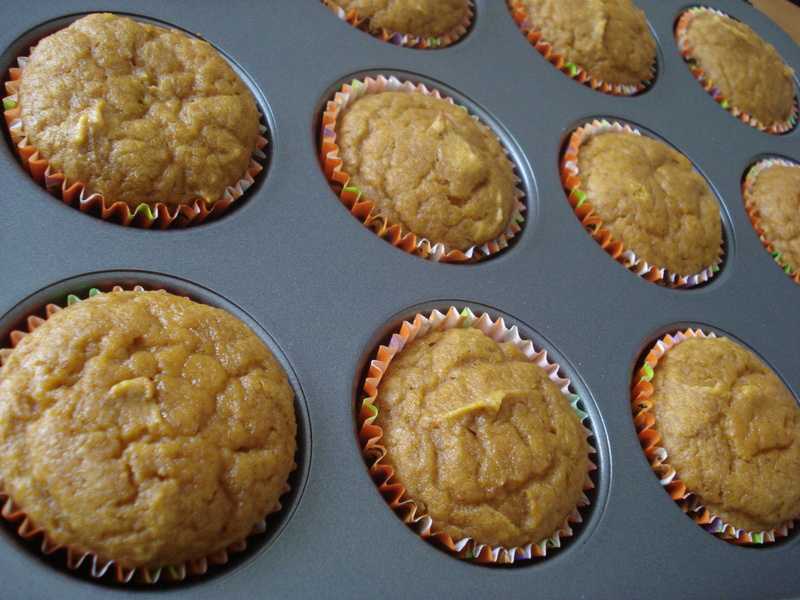 You can use any brand of Pumpkin Pie Spice but I really enjoy what this particular blend brings to the cupcakes and how it accurately brightens the pumpkin flavor without overpowering it. I would have the base flavor no other way. 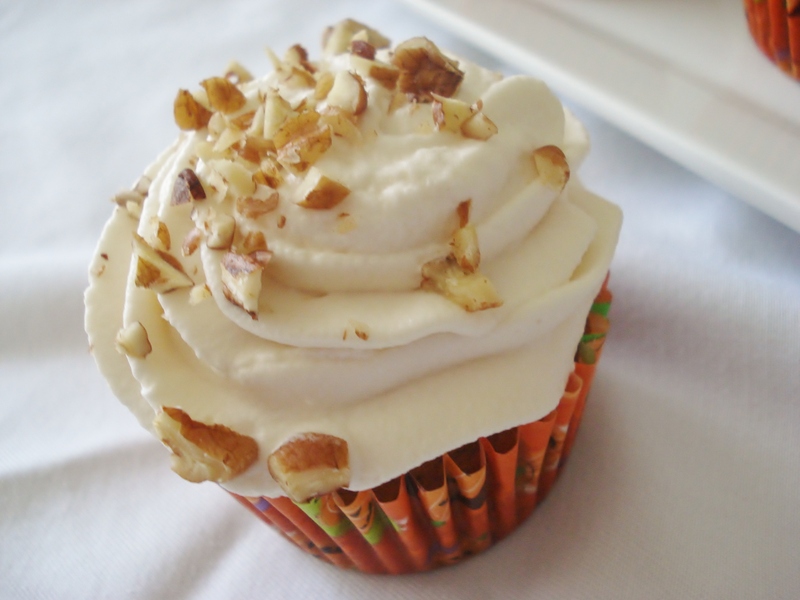 To bring the Praline flavor to the cupcake without overshadowing the pumpkin flavor, which must always be the star of the show, I chose a very light and airy whipped topping like frosting called Chantilly Cream. I chose this not only to be a light and delicate way to introduce the praline flavor, but also keeping in mind that this is a deconstructed version of a pumpkin pie and how do most people top their pumpkin pies… with Cool Whip. To make Chantilly Cream you simply whip cold heavy cream to stiff peaks then add any flavors you are wishing to achieve. For my flavoring, I chose Maple Syrup because it gives a nutty caramel flavor much like what is found in a Pumpkin Praline Pie. Now I know I often give short cut time saver tips but I really don’t suggest you ever use Cool Whip as a substitute to making Chantilly Cream yourself because there is no comparison to the homemade variety and since it is so simple and takes only a few minutes the stuff you buy prepared really doesn’t save much time and costs far more than standard cream and imparts a processed flavor which can overshadow your flavor additions and even the cake base itself. So no cheating with this one. 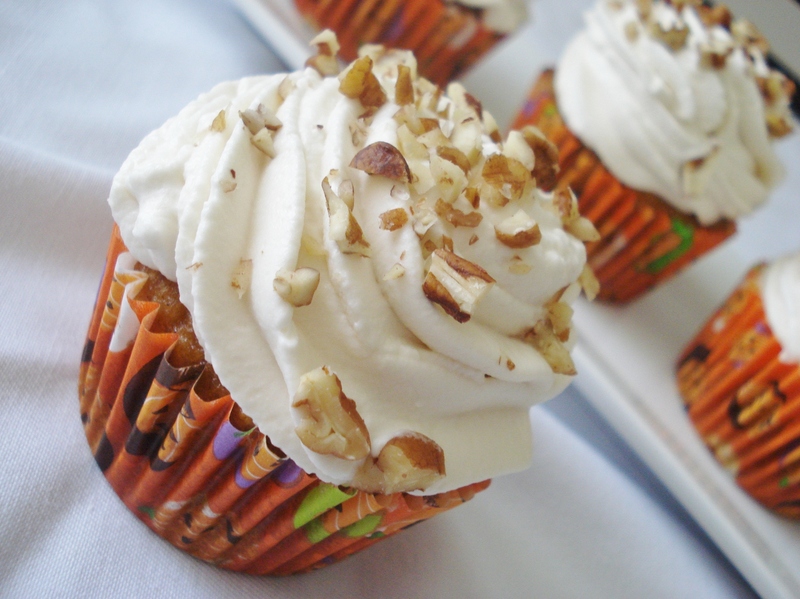 To round out the final flavors of the traditional Pumpkin Praline Pie and add an elegant finishing touch to the look of the cupcakes, I toasted and chopped a few pecans and garnished the Maple Chantilly Cream. After a slight traumatic incident involving a spooked cat, cut toe, and suicidal cupcake I had to clean off the floor, I was finally able to enjoy this fall masterpiece that had scented up my kitchen all morning. Let me tell you… the moist, tender pumpkin cake slathered with the light maple cream and crunchy pecan garnish was… truly…. delicious!!! Adjust oven rack to the middle position and heat to 350°. Place cupcake liners in a cupcake pan and grease liners with cooking spray (You can use Halloween or Fall themed liners for added effect). Mix flour, pumpkin pie spice, baking powder, baking soda, and salt in a bowl. Using a stand mixer fitted with the paddle attachment, beat the sugar, butter, and eggs on medium-high until mixture is pale and fluffy, about 3 minutes. Reduce the speed to low and add the pumpkin, mixing until incorporated. Slowly add the flour mixture and mix until just combined, about 30 seconds. A few small streaks of flour may remain which is okay. 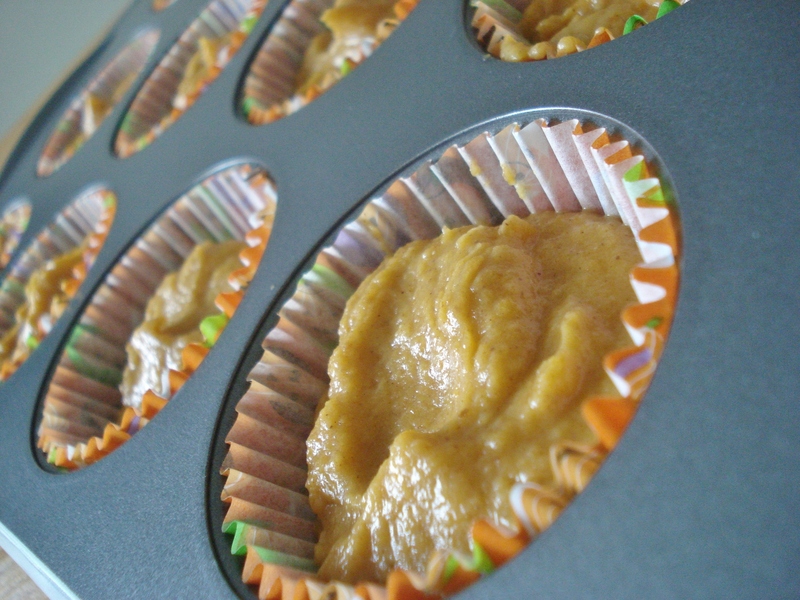 Place the batter in a measuring cup for easing pouring and fill each cupcake liner ¾ full. Bake about 12-15 minutes. Let cupcakes cool in the pan on a wire rack for 10 minutes, then remove cupcakes from the pan and allow to cool completely on the wire rack. Fill a piping bag fitted with a large star tip with the Maple Chantilly Cream and pipe in a circular motion on the top of the cooled cupcakes. 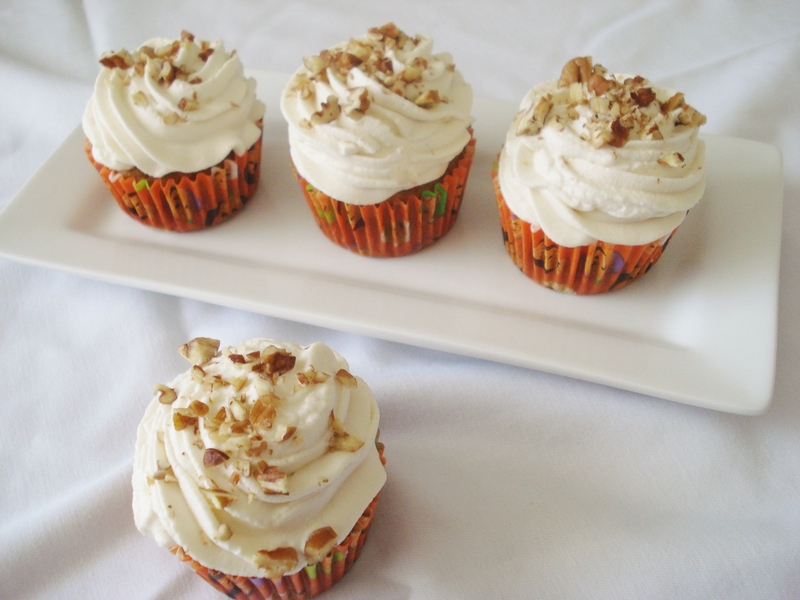 Finish cupcakes with a sprinkle of pecans. Serve. Store any leftovers in refrigerator up to three days.